Season seven of 'The Office' marks an important milestone and shakeup for the series, and while it's hard to believe that anyone reading this could be unaware of the big and widely reported changes, for those that might somehow still be in the dark about the season's final few episodes, please be aware that there are some spoilers ahead. In life almost everything has an expiration date. From milk, to eggs, to batteries, and yes, even television shows, there is always a termination point. Eventually there simply comes a time when even the most entertaining and seemingly limitless premises fully exhaust themselves. When once likeable and relatable characters finally overstay their welcome and formerly biting comedy grows redundant. On some programs, there is actually a specific moment when it becomes clear that the show has reached this so called point of no return, when it has "jumped the shark" so to speak, and continues to limp on haphazardly long past its natural end point. For NBC's popular sitcom, 'The Office,' whether that unfortunate instance has been reached or not is up for debate. While even the most ardent fans must admit to a gradual decline in quality, with characters and situations progressively losing luster, creativity, and believability, as far as I'm concerned the show has still managed to remain entertaining and funny throughout its run, occasionally bouncing back from periodic lulls in storytelling. Some naysayers might point out the birth of the serendipitous Halpert baby, Cece, as the figurative nail in the coffin, but really there hasn’t truly been any one particular moment of discord heralding the end. But now, with the show's seventh season, that could potentially change. With a big, game-changing arc, it's a season that could conceivably end up reinvigorating the show's creative juices or conversely finally signal the ultimate death knell for the long running series, marking the moment it officially "jumped the shark." With the much publicized departure of star Steve Carell and his lovably idiotic alter ego, Michael Scott, 'The Office' may never be the same again. Even if the decision to continue the series beyond Carell's exit proves suspect, there is no denying that the journey toward his farewell offers many worthwhile and wonderfully funny moments, effectively demonstrating all of the show's later day strengths and weaknesses. The character's swan song fuels a mostly successful but not perfect season full of awkward humor, genuine emotion, and a few unfortunate but mostly minor missteps along the way. The usual cast of characters all return for another year of workday antics and social ineptitude. Joining Michael's season long, show exiting arc are more traditional episodic storylines that delve into the show's usual mixture of uncomfortable humor, wincing reactions, and increasingly exaggerated situations, all set around the everyday happenings of a Pennsylvania paper company. This season sees recent parents Jim (John Krasinksi) and Pam (Jenna Fischer) adjust to their new roles in life, Andy (Ed Helms) continue to vie for Erin's (Ellie Kemper) affections, Dwight (Rainn Wilson) take ownership over the office building, Angela (Angela Kinsey) begin dating a (state) senator, and various office workers compete for Michael's soon to be vacant job. The numerous plotlines lead to an overall entertaining collection of episodes that mark an improvement over the show's more uneven sixth season. With that said, the program does disappointingly continue its more recent habit of sacrificing characters' intelligence and likeability for the sake of easy laughs. The general rule of thumb here, and indeed on far too many contemporary comedies, appears to be, "If it's funny, do it." While this may at first seem like a very appropriate mission statement for a sitcom, this approach can often lead to some problems. The fact of the matter is, this isn't just a simple standup routine or a disposable sketch where the only goal is an eventual punch line. This is a full-blown television series that was actually once grounded in a certain level of realism and interesting character work. 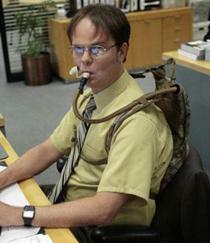 Sure, there have always been more outrageous and ridiculous aspects to the cast and plotlines, particularly when dealing with Michael and Dwight, and those idiosyncrasies are part of what made the show so great to begin with, but the series used to keep at least one foot firmly planted in reality, offering a humorous and relatable look at the monotony of the average workplace. As old plotlines eventually ran their course, this more grounded aspect changed over the years, to both good and bad results. Characters and storylines have essentially grown more broad and exaggerated, and though Michael Scott's socially inappropriate behavior always stretched the limits of good taste and intelligence, the writers sometimes take him too far. Michael once felt like a real person (well, sort of), and it was always clear that the man's unacceptable behavior was merely masking a deep rooted, sympathetic desire to be liked, and some of that has been lost. Though an improvement over some of the previous seasons, this is still evident throughout several of the episodes, with the character saying and doing things that step outside even his rather wide boundaries of idiocy. Though he redeems himself in the end, some of his behavior in "Andy's Play," "Viewing Party," and "Training Day" are all good examples, with Michael often becoming rather unlikeable for the sake of a laugh. Yes, part of what makes Scott so entertaining to watch is his lack of social etiquette, but at some point there has to be a limit or the character just becomes a caricature -- and when that happens it becomes impossible to invest in him when the show decides to shift into more emotional gears. Thankfully, despite a few stumbles, the series does manage to keep the character in check enough so as not to ruin his genuinely touching farewell, but it does sometimes come a bit too close for comfort. Other cast members also demonstrate this gradual trend toward more excessively outlandish behavior. Andy and Erin's courtship is perhaps the best example. With Jim and Pam, the first few seasons of the show created a sweet, subtle, believable romance between two best friends that played out with just the right amount of humor, angst, and emotion. With Andy and Erin, it's as if the writers are going out of their way to demonstrate exactly how much the show has changed, by forging a strange, misshapen, and sometimes just plain stupid version of that same plotline. Erin in particular stretches the show's credibility too much, and though her odd, naïve, and often clueless behavior provides some decent laughs, too much of her character is sacrificed for a few easy jokes. The "if it's funny, do it" mantra seems to make sense on paper or slapped across a whiteboard in a writer's room, but when the humor comes at the expense of actual emotional investment in the characters, perhaps it's best to hold back some. OK, soapbox rant over. With all that criticism it may seem like I'm not really much of a fan of the show, but honestly that couldn't be further from the truth. As a big admirer of the original British series, I was a bit skeptical of the American "reimagining" at first, but 'The Office' quickly proved itself over the course of its first few seasons and soon cemented its own identity as a truly great show. In fact, it's still a real favorite of mine, and is among the shows and films that truly made me want to pursue screenwriting. Thankfully, despite some hiccups and inconsistent characterizations, this season is still full of many great, gut-busting episodes. After all, it's hard not to like scenarios that involve a 'Glee' viewing party, an office garage sale, a screening of Michael's legendary amateur film 'Threat Level Midnight,' and Dwight Schrute finally getting his chance to lord over his coworkers. The overall season long arc which sets up Michael's departure also works well, and while bringing Holly (Amy Ryan) back does seem a little convenient, it's hard to begrudge the writers for wanting to give the characters a happy ending. Carell's final episode, "Goodbye Michael," is a highlight, and despite the character's many creative ups and downs over the years, the writers handle his departure with a funny and sweet blend of humor and heart. Watching Michael gradually bid farewell to his makeshift family, with all of the subtle and not so subtle references to previous episodes and seasons provides for a fairly fitting and thankfully not overly sentimental goodbye. With that said though, if this truly is the last we see of Michael Scott, his entire series long story disappointingly lacks any kind of real substantial growth, and while perhaps not fair to compare, it pales in comparison to what the British series was able to accomplish with a similar character in only fourteen episodes. The last few installments of the season serve to set up the post-Carell era of the show and while the producers rely far too heavily on guest stars and stunt casting, prolonging the mystery of who will replace Michael with various candidates, the actors do all fit well within the (current) tone of the series. Will Ferrell's Deangelo Vickers is certainly an entertaining addition, but unfortunately he again demonstrates some of the show's weaknesses, as his personality tends to shift on a scene by scene basis in order to serve whatever comical situation the writers have in store. Other big name guests include Kathy Bates, Timothy Olyphant, Will Arnett, Ray Romano, Ricky Gervais (as the one and only David Brent), a blink and you'll miss it appearance by Jim Carrey, and a scene-stealing turn by James Spader. The season finale's reliance on many of these brief cameos is a bit gimmicky, but the episode and its predecessor, "Dwight K. Schrute (Acting) Manager," do effectively present a version of 'The Office' that seems to carry on just fine without Michael Scott. Of course, just because they can carry on, doesn't necessarily mean they should. So with Steve Carell's departure, has 'The Office' finally met its natural and inevitable expiration date? Has it reached its "shark jumping" point of no return? Is this the final nail in the coffin? Well, only time will tell, but the last few episodes thankfully seem to point to the contrary and definitely show positive potential. Still, some part of me does feel like this would have been a fitting place to bring this mostly wonderful series to a close. Regardless of what's to come, season seven itself is home to some strong episodes and though a little uneven, the writers do more right than wrong and continue to present a consistently funny program. The season succeeds on most fronts and effectively bids farewell to its star character with wit, heart, and respect. I remain cautiously hopeful about what the showrunners have in store for the upcoming eighth season and look forward to the premiere on September 22nd. Universal presents all twenty four episodes of 'The Office: Season 7' on four BD-50 discs housed in a foldout case with a cardboard slipcover. Each side of the foldout holds two discs, and in a slightly annoying decision, it's the type of design that requires you take out the top disc in order to get to the bottom Blu-ray. A collectable poster is also included in the package that parodies Georges Seurat's famous painting "A Sunday Afternoon on the Island of the Grand-Jatte." The show is presented in a series of 1080p/AVC MPEG-4 transfers in the 1.78:1 aspect ratio. Though not known for terribly exciting visuals, the series looks rather nice on Blu-ray showing off some pleasing detail with no major technical hiccups. Shot digitally in high definition, the source is pristine and though quality can vary from shot to shot, there are few real signs of noise or other distracting artifacts. While the monotonous world of an average office space doesn't exactly lend itself to very impressive or interesting images, the filmmakers do what they can with the documentary approach. Detail can be very nice, but the high key, mundane lighting does lead to a fairly flat look. Colors are natural and bright but not overly vibrant, reinforcing the realistic shooting style and inherent modest nature of the show's setting. There is some occasional and welcomed pop, however, especially in scenes that break away from the usual workplace. Black levels are mostly consistent and while whites can be a bit blown out or overexposed, particularly when characters are standing next to windows, overall contrast is good. 'The Office' isn't exactly impressive looking, but the transfer offers some solid levels of detail and realistic but still pleasing colors. Besting its compressed and interlaced original broadcast appearance, this is a very nice video presentation. The series is provided with English DTS-HD Master Audio 5.1 tracks and optional English SDH and Spanish subtitles. Like the video, the audio reinforces the mockumentary style with a fairly stripped down, front heavy presentation. The show is very dialogue centric, and for the most part speech is nice and clean. There is some minor crackle here and there, though, and some lines can sound a little thin. Directionality is infrequent and rear activity is mostly absent, save for some faint ambient effects of everyday office sounds. Dynamic range is pretty flat and bass is essentially nonexistent. Balance between the sparse effects and speech is handled well. While there is rarely any substantial level of immersion or variety due to a lack of effects work and score, the soundtrack does what it needs to do, and delivers the humorous dialogue in an acceptable manner. The mix is very average and basic, but a more spruced up and active track would most likely seem out of place and ill suited for the material. It may not be technically impressive, but the audio fits well with the show. Universal has put together a great assortment of supplements, including commentaries, extended episodes, deleted scenes, and bloopers. All of the extras are spread out over the four discs and are presented in 1080p with Dolby Digital 2.0 sound and optional English SDH and Spanish subtitles. It should be noted that a lot of the supplements, including the deleted scenes, are mixed noticeably lower than the actual episodes, which can be a slight annoyance. "Nepotism" Commentary with Cast and Crew - Paul Lieberstein, B.J. Novak, Creed Bratton, Craig Robinson, and Daniel Chun sit down together for this track. The group toss out occasional bits of trivia focusing on topics such as the episode's elaborate opening number, preparing stories for Carell's last year, the characters' consistent wardrobes, and various script changes. While the gang can be fairly amusing, there are some lengthy pauses in the conversation where they simply seem to be watching the show themselves. Still, fans of the series might want to take a listen. Deleted Scenes (HD, 42 min) - Deleted scenes are presented for all eight installments on the first disc and are available to view together or separated by individual episodes. The excised material is all rather entertaining with a few comedic gems thrown in that more often than not seem to have been removed solely for time. In some cases, entire subplots have actually been taken out. Some highlights include Kevin's new habit of lying, the reveal of why Dwight wanted the wizard in "Counseling," and a fairly amusing reference to Jansport backpacks. "PDA" Commentary with Cast and Crew - For this track participants include Greg Daniels, Ellie Kemper, Angela Kinsey, Brian Baumgartner, Claire Scanlon, Kelly Cantley, and Robert Padnick. While a bit more consistent than the last track, the level of actual useful information varies throughout, though the group is pretty entertaining. They primarily discuss some script changes and story debates, deciding upon the level of PDA to show, and some of their favorite lines. It's not essential listening, but does offer some decent insights. Deleted Scenes (HD, 32 min) - Deleted scenes are presented for "WUPHF.com," "China," "Classy Christmas," "Ultimatum," "The Seminar," and "PDA." Again, there is some strong and sometimes substantial material here that is definitely worth a look, including an amusing story from Creed concerning the creation of Chuck E. Cheese's, and more slurred antics from a drunk Pam and Jim. "Threat Level Midnight" Commentary with Cast and Crew - B.J. Novak, Craig Robinson, Creed Bratton, Charlie Grandy, and David Rogers provide commentary on this fun episode. Novak, who wrote the installment, leads most of the discussion and offers some amusing bits of trivia that detail the process of creating Michael's action movie. They also point out cameos from past characters, and expand upon some cut material. Deleted Scenes (HD, 12 min) - Deleted scenes are presented for "Todd Packer," "Garage Sale," and "Michael's Last Dundies." With this set of excised material we get more Packer, more Olyphant, and learn what Dwight traded to get his telescope in "Garage Sale." Like the previous installments, these are definitely worth a look. Threat Level Midnight: The Movie (A Michael Scott Joint) (HD, 26 min) - This is the full, uncut version of Michael Scott's amateur, spy-action epic. A fun parody of big budget blockbusters, this is a welcomed inclusion that offers some more worthwhile jokes. Also, make sure to stick around after the credits for an extra message from Michael and Dwight. Training Day Extended Version (HD, 34 min) - This is an extended version of Will Ferrell's first episode, "Training Day," and features about twelve minutes of additional material. The added scenes offer a few more entertaining moments of bonding between Deangelo Vickers and Michael Scott, as well as the introduction of Vickers's struggle with obesity. "Goodbye Michael" Commentary with Cast and Crew - Greg Daniels, Ellie Kemper, Brian Baumgartner, and David Rogers provide commentary on this important installment. The participants focus on the bittersweet atmosphere on-set during Carell's last episode, point out callbacks to previous seasons, and discuss what it was like to work with Will Ferrell. Though it would have been nice to hear from Carell himself, the group offers some nice insights into the creative process behind the show's emotional farewell to Michael Scott. "Dwight K. Schrute, (Acting) Manager" Commentary with Cast and Crew - Here participants include Mindy Kaling, Ellie Kemper, Angela Kinsey, Steve Hely, and Justin Spitzer. The group mostly focuses on how much they love the episode but do offer the usual bits of trivia involving script changes and other oddities (apparently Angel Kinsey is immune to tear gas) that make for an entertaining but not essential listen. Deleted Scenes (HD, 23 min) - More deleted material, this time for "Goodbye Michael," "The Inner Circle," and "Dwight K. Schrute, (Acting) Manager." The bulk of the scenes are dedicated to more from Ferrell as boss, the return of David Wallace, and a subplot about Dwight's decision to shut down the internet in the office. Like the previous deleted scenes, there is some pretty funny material scattered throughout. Blooper Reel (HD, 15 min) - While fifteen minutes might seem a little excessive for outtakes, this reel of flubbed lines and fits of laughter from the cast and crew is actually very funny and entertaining. The group really seems to have a good time together on-set and their laughter is infectious. Webisodes - The 3rd Floor (HD, 8 min) - Available to view in three separate installments or all together, these webisodes which originally ran on NBC.com feature some of the supporting characters filming a horror film in the office. While not as strong as the show itself, this is definitely worth a laugh or two. Search Committee Extended Version (HD, 56 min) - This is an extended version of the season finale that mostly features more material from the various guest stars and offers a few more laughs here and there. 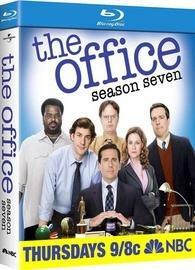 'The Office: Season 7' is an important and mostly successful collection of episodes for the long running show. Michael Scott's swan song proves to be both entertaining and emotional, and though the show still struggles with some inconsistencies, it remains as funny as ever. Video and audio are both solid and supplements offer a wealth of quality additional material. Those that were turned off by some of the previous seasons' missteps might want to give this set a look, and loyal fans of the show should not hesitate to pick this up.